I think of myself as a heavy Firefox user. 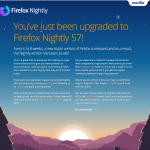 I use the latest version of the browser (3.6.8) and a preview version of Firefox 4 with a different profile for testing and evaluating purposes. I have always opened two stable versions of Firefox with two different profiles at the same time (by using the -no-remote directive when running it). In my primary profile there’s arround 100 tabs open at any time, in my secondary profile I have around 10 tabs open. My profile has 40 add-ons installed. At the same time I use Google Chrome also, mainly for evyluating it, but more and more often for playing Youtube videos and incognito mode. I am not a Chrome power user (yet) – there are still some important issues with Google Chrome, mainly based on system hogging. Today I have checked the memory usage of all my opened browsers. My primary Firefox (with 100 opened tabs) uses around 800 kb, my secondary Firefox around 150 kb, and each Chrome process between 7 kb and 70 kb. I have 5 tabs open, but the number of Chrome processes is 13, probably because of the plugins. The top 5 processes (that I think are tabs) use between 30 kb and 70 kb. I made a short calculation which I think is correct: If I open 100 tabs in Chrome, they would use up between 3 GB and 7 GB of memory. Compared to 800 kb in Firefox I conclude that Firefox in more memory efficient than Google Chrome for a large number of simultaneously opened tabs. I think the difference is too big and is probably the reason why I find Chrome hogging my system. Just keep stretching facts ff whore. Chrome is clearly the more efficient browser and all tests prove this to be the fact. I can run 30+ streaming videos on chrome with no lag and, lately, I can’t even use two facebook apps at the same time on firefox. It’s become just utterly unusable. Your Reflection, thanks for sharing your point of view. I agree that Chrome is faster and works faster, but the way I use my browser (with many tabs open) Chrome just doesn’t do it’s job (yet!). It stops my system for a few seconds while I open or close tabs and that’s not acceptable for me. Maybe it’s just my system that’s underpowered. But I completely agree with you that Firefox is becoming slower and that in all the tests I’ve run Chrome is faster (including on my system). I run Chrome 7 and it gets better with every version. Being used to Firefox, I just don’t think Chrome is there yet – I’m not ready to make a switch yet. However, if I hadn’t had a browser and would pick one from the beginning, I probably would pick Chrome.